When I was a kid I really loved a fruit called ambarella. 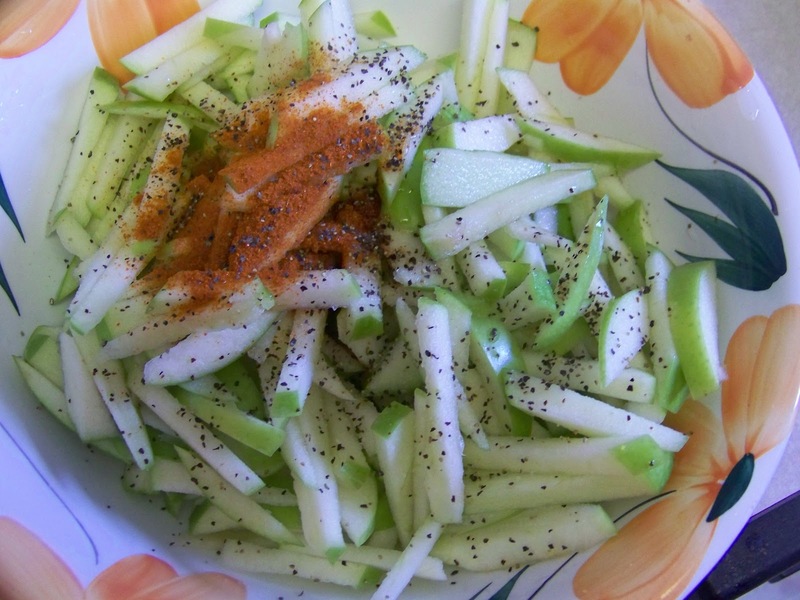 It's a tart fruit that is delicious in a spicy chili, vinegar and salt dressing. Unfortunately, ambarella does not grow in the United States and I have never seen it in the Asian markets so I had to come up with a closed substitution. 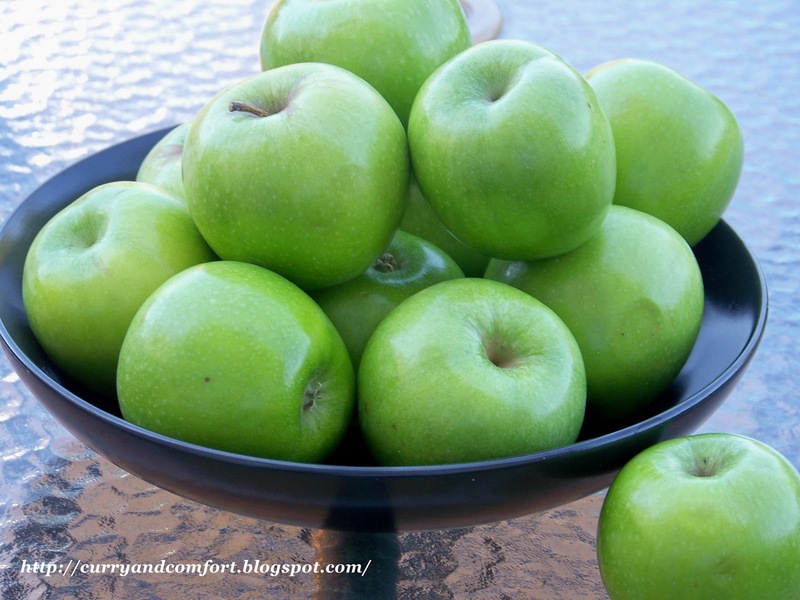 The closest fruit I have found to the tartness of the ambarella fruit is the Granny Smith Apple. I can eat this entire dish myself (in one sitting) and not share. Now this may not be everyone's cup of tea. If you are not fond of sour/tart flavors mixed with spicy and tangy flavors you will not be as crazy about this dish as I am. BUT if you do like to walk on the that "tarty" side.... look out. 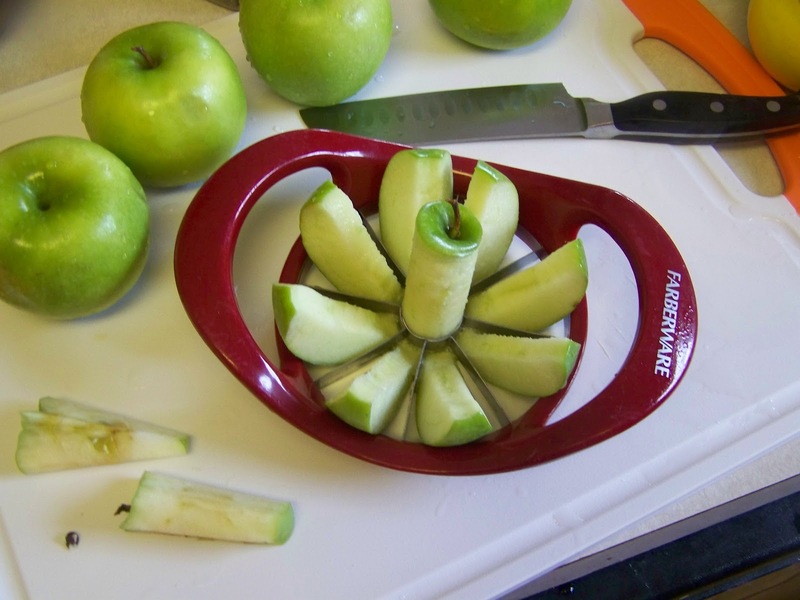 Wash apples and core them. Slice into match sticks. 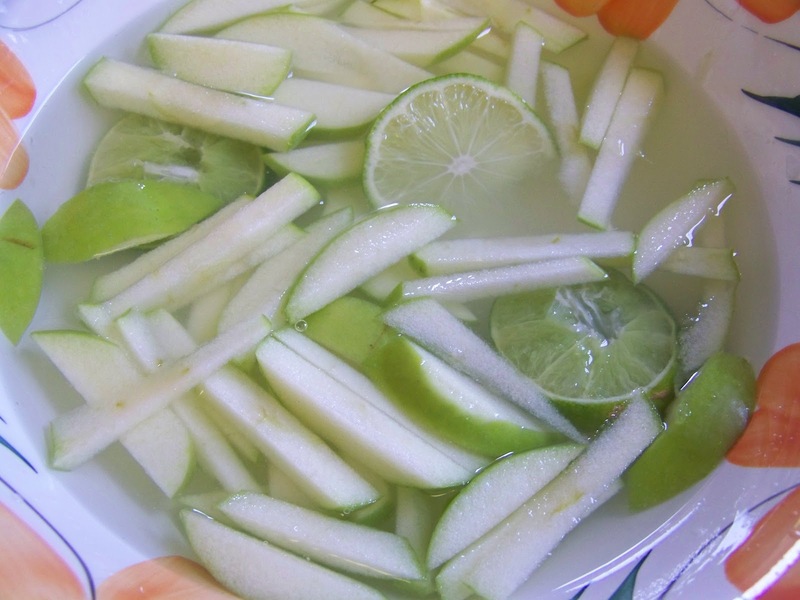 Prepare a bowl of cold water with some lime juice to place the sliced apples so they don't brown. Drain apples from lime juice and water then dress with red chili powder, salt, black pepper and vinegar. 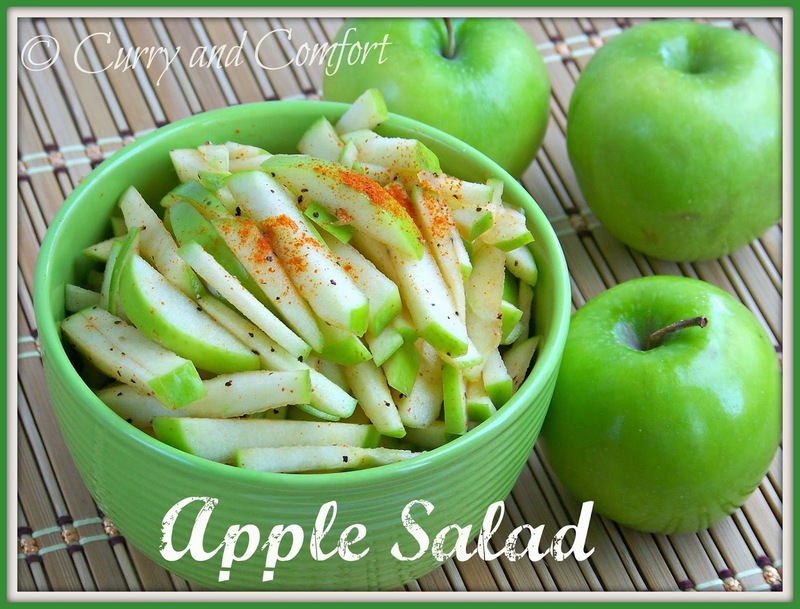 Play with flavors until you have a spicy/tangy/sour flavor that enhances the tartness of the apple. Eat at room temperature or chilled. Enjoy. 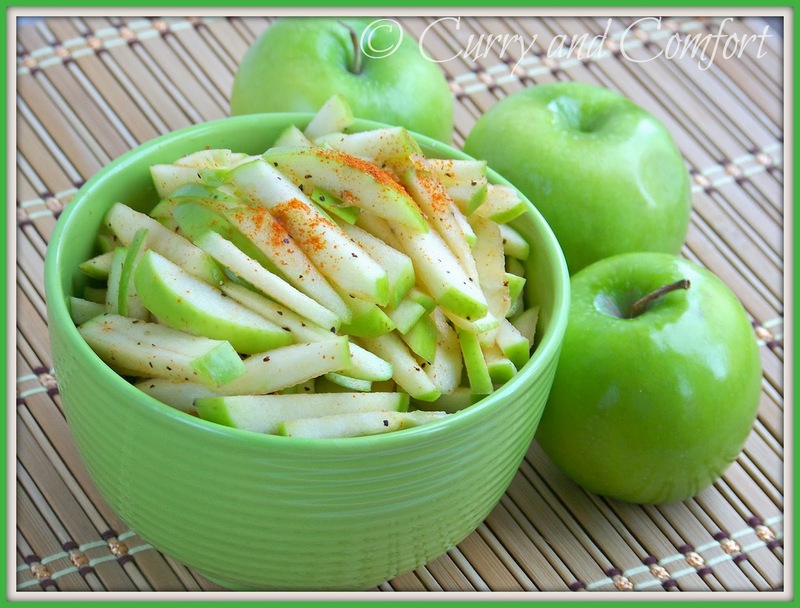 Oh wow, what a stunning picture of this beautiful apple salad! The recipe is equally mouth-watering. Shall try this recipe: saving this for the weekend!! I could really go for this salad Ramona. Those granny smith appples are the best. I sometimes slather peanut butter on them. Crunchy munchy salad, simply loving it. 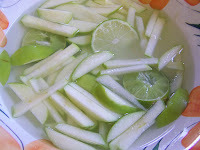 I would really love this on a hot summer day. YUM! I've been seeing a host of slaw recipes recently and this one sounds super simple and delicious. Lovely pictures, Ramona. This baby packs a serious punch!! This looks incredible. I think even mini-me would love this one. What an interesting idea! Have to try it! Tartness is not my cup of tea but my husband would love this snack. His favorite apples are Granny Smith.